The roots of City of Rauma -the game can be tracked as far as late 2004. During that time I had already made some computer software, and even one game, Space Bug. I wanted to do something new. As a fan of the Sim City games and being interested in history, I was pondering about the possibility of a game set in ancient Rome. I actually started making that game, as a proof you can still see an early promo-site at the following address: www.juhoruohola.fi/cr. Eventually I dumbed the idea, since some Rome-building games had already been released. I have to admit that I’ve always loved my hometown of Rauma. 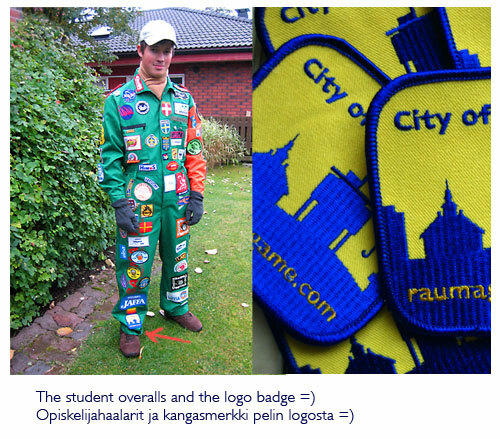 In early 2006, as part of my studies, I started a half year work-life training at the communications office of the Rauma town. Thus, after the training period I was even more of a Rauma-lunatic. During summer 2006 I started to re-think about making a city-building simulator, only this time situated in Rauma instead of Rome. And it was a perfect time for that, since 2007 would be the 565th birthday of the actual town. Great spot to make something special. A computer program comes out of nothing. The computer has to be told what it needs to do in any given moment, what to do when user clicks on a certain point etc.. These instructions are passed through program code, which I had to come up. The initial programming began in Autumn 2006. The programming language was REALbasic, which is quite simple language and I had used it in my earlier projects too. In the early stage I made various test applications, e.g. 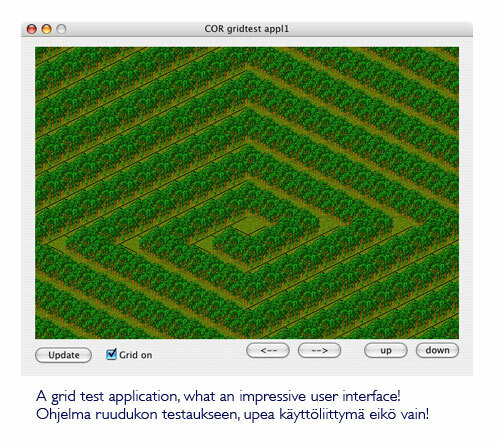 a test program for creating the grid of the game field (by the way, there are 250 x 250 = 62 500 zones in the grid). Making some of the functionalities was easy, some not. In few cases there was quite enough of brainstorming, here’s an example of some complicated code: “b=(y+280-(x+180)*0.5)+130”. To be honest, I don’t even remember right now what that specific piece of code does =D I admit, that from time to time the programming was so frustrating I had week long pauses from doing anything related to the game. Once the test applications were good enough, I started working with the actual game. This was in January 2007. Even at this point there was so much of trouble and problems that the original deadline passed by. That day was the Rauma Day on April 17th. My new goal was to make even some kind of release of the game by the end of the year, before the 565-celebrations of the Rauma town ended. That goal was reaches in Autumn 2007, when I made the first release of the game on October 20. Already in the very early stage, even before starting the programming, I was already sketching some of the graphics for the game. The first finished graphics was the Water tower. I used that building in my early, primitive advertisement too since it was the only building I had been able to draw. During the whole programming stage I was simultaneously making the graphics. In the beginning I used a simple but great application Color It! which suited perfectly for pixel-level artwork. Eventually, with new Mac in use, I moved to Adobe Photoshop. Pixel-level art is a fit name for the graphical work that was needed for the game. So much had to be included into a small game zone (width of 52 pixels). It was, however, completely necessary to make largest images for the biggest buildings, the maximum width of a building is 4×4 zones. Making such graphics is incredibly slow, even regarding the small size. Having to figure out the most distinguishable features of buildings and compressing them to small size took many attempts before resulting in a natural looking version. 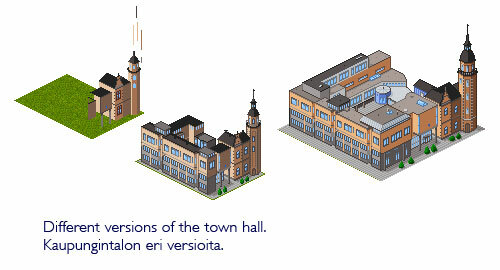 For example the town hall was re-made a couple of times. Since I was making both the programming and graphics, it came quite clear in an early stage that I simply couldn’t make enough of graphics all by myself. So fortunately, my big brother Matti agreed to help me out. During his off-work time he made graphics with a pace and great detail, resulting in most of the fantastic buildings in the game. In the end, me and my brother created more than 150 different graphical objects that form the game’s terrain, forests, buildings etc. The user interface was my work including the logo. I actually produced a cloth badge of the logo, mainly because I wanted to show it off on my and my friends student overalls. =) There are actually few badges still remaining! Since the initial release of the game I have made few updates, latest version also including music by Matti Mustonen. 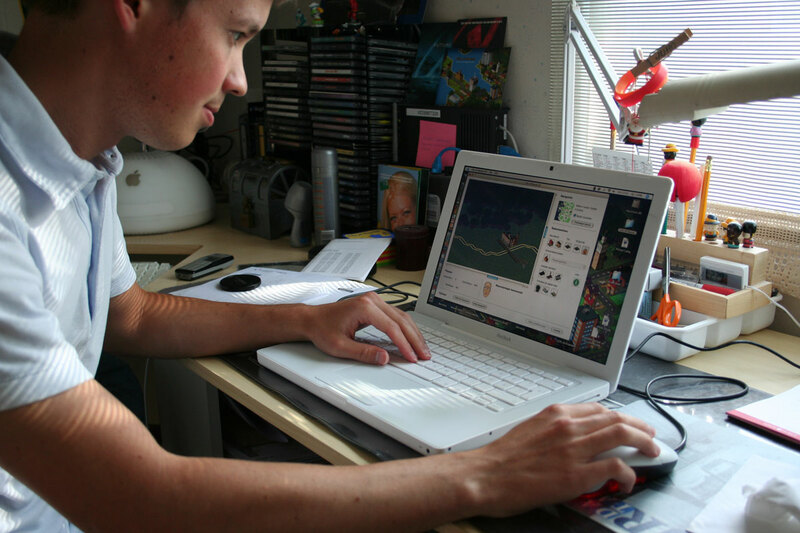 Sadly, after my graduation, and the end of my student career, in December 2007 I haven’t had much of enthusiasm nor interest in updating the game..
Around the time of the release there was a big story about the game in the major local magazine of Pori (the ‘rival town’ of Rauma! ), Satakunnan Kansa. There was also a story in a newsletter sent to every household in the town of Rauma. Days following the news stories, there were hundreds of daily visitors, and even now a year after the initial release, there are still around 30 visitors every day. 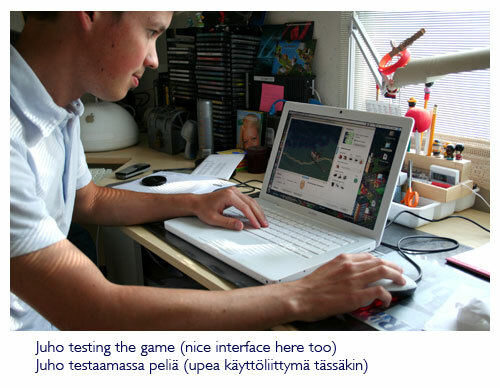 The game has spread to multiple web sites, even some that I’ve never heard of before, such as Suomipelit and Jonneweb. In a year’s time the game has been downloaded over 25 000 downloads directly from this game’s website alone! A crucial part of the game’s making was to include inside jokes and stuff. Therefore, there are quite a few things people might not know or notice. For instance, you can recognize my home, my old school (Kourujärven koulu), my brother’s and our grandparents’ home. One feature in the game is a tribute to my high school times..
Just for the testing purposes (yeah, right) I made up a cheat code system into the game. So cheat codes exist! As a hint I might say that these codes are, e.g. a famous slogan from Rauma, a famous cheat code from a legendary 3D-shoot-em-up and a name of an X-Files episode… so off you go and give it a try! The game project was perhaps a too big bite for one person, but luckily I was assisted by many people, to whom I own a great gratitude! All in all, I’ve been pleased to have built this game since there has been feedback from all around the world, and it’s been mostly positive! For now, my interested in further updating has gone out, which saddens me since I still get occasional feedback about the game. Maybe some day I’ll once again make an update, but I would be lying if I wouldn’t say that the odds for that are quite low.. Hopefully people understand this, especially because the free game brings me no income. I just hope that people have enjoyed the game, despite the simplicity of it! Once more; many thanks to everyone who have committed their efforts in making or testing the game and naturally to all of you people who have downloaded and played City of Rauma -the game!